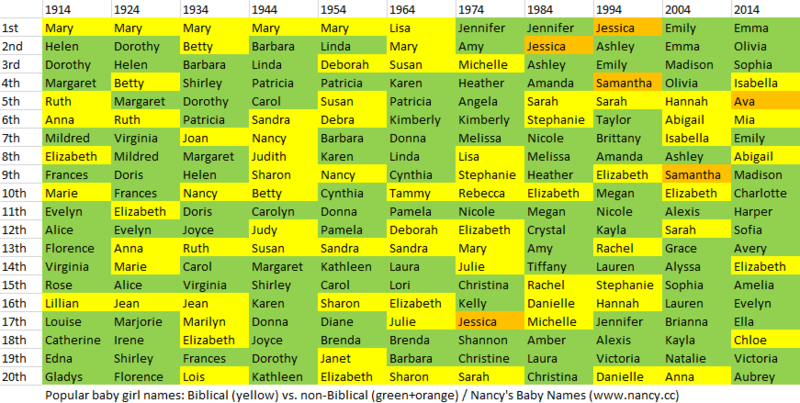 How popular is the baby name Aubree in the United States right now? How popular was it historically? Find out using the graph below! Plus, check out all the blog posts that mention the name Aubree. Various websites have been echoing BabyCenter.com’s claim that Star Wars names like Rey and Kylo are now trendy baby names. The problem? It’s all conjecture. So far, real-world data does not indicate that these names are being bestowed often enough to qualify as “trendy” (à la Nevaeh). We might have to wait a year or two (or ten) for that data, if we ever get it at all. In the meanwhile, let’s check out the name Cindel — a Star Wars name that everyone seems to have forgotten about. Variants Cyndel and Cyndal debuted in 1985, and the one-hit wonders Cindal, Cyndil, and Cindell appeared over the next couple of years. A pair of made-for-TV movies based on stories by George Lucas. Caravan of Courage: An Ewok Adventure aired on ABC in November of 1984, and the sequel, Ewoks: The Battle for Endor, aired on the same channel one year later. Both films feature a young human character named Cindel Towani (played by actress Aubree Miller). In the first film, a family of humans is shipwrecked on the forest moon of Endor, home of the Ewoks. Parents Jeremitt and Catrine Towani are promptly kidnapped, and their children — brother Mace and sister Cindel — locate and rescue them, with the help of the Ewoks. In the second film, a group of marauders kills everyone in the Towani family except for Cindel. She and several friends fight the marauders, and in doing so obtain the star cruiser energy cell that Cindel needs to finally leave Endor. In the book A Brief Guide to Star Wars, author Brian J. Robb notes that Mace is “a name from Lucas’s earliest Star Wars drafts later used for Samuel L. Jackson’s Jedi character in the prequels.” I can’t find any clues about how George Lucas came up with Cindel, though. What are your thoughts on the name Cindel? Robb, Brian J. A Brief Guide to Star Wars. London: Constable & Robinson Ltd, 2012.